Lonnie Mortenson 2 years, 2 months ago. Android Nougat 7.0 ROM, Lenovo Vibe Z2 Pro CM14/CyanogenMod 14 has now arrived via an UNOFFICIAL build. In addition to this Cm14.1 ROM we also have the Lineage 14.1 for Vibe Z2 Pro. For latest updates, stay tuned to the Lineage OS device list page. Since Google released Android Nougat Source code, we have update many Android NOUGAT AOSP ROMs and also we have update a big list of available CM14/CyanogenMod 14 Nougat 7.0 ROMs. This CM14 for Vibe Z2 Pro (kingdom_row) is brought to you by developer frantisheq and Electry. If you like their work then you can donate them to encourage so that they can keep up their good work. Here is the Donation link to frantisheq and here is the Donation link to Electry. THIS IS AN INITIAL BUILD. THIS MAY NOT BOOT AT ALL OR IF IT BOOTS IT MAY HAVE MANY MORE BUGS THAN YOU CAN IMAGINE. TRY AT YOUR OWN RISK. Installing a custom ROM on a Vibe Z2 Pro requires the bootloader to be unlocked on the Vibe Z2 Pro phone, which may VOID your warranty and may delete all your data. Before proceeding further you may consider backup all data on the phone. You are the only person doing changes to your phone and I cannot be held responsible for the mistakes done by you. TWRP recovery for the Lenovo Vibe Z2 Pro. Download and Copy the GApps and Vibe Z2 Pro CM14/CyanogenMod 14 ROM ZIP to your phone. First flash the Vibe Z2 Pro CM14 ROM ZIP from device. Then flash the GApps zip from your device memory. Then reboot into recovery (don’t skip this) and flash the CyanogenMod 14/CM14 Nougat GApps package. Reboot and Enjoy the Nougat 7.0 ROM CyanogenMod 14/CM14 for Vibe Z2 Pro. 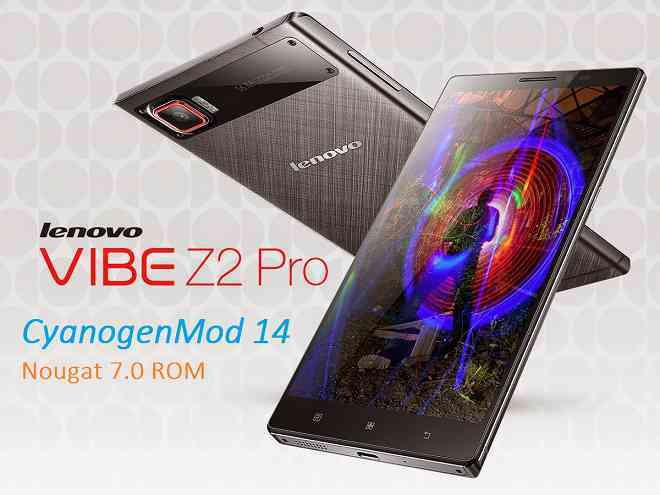 Copy the latest Vibe Z2 Pro CM14 ROM ZIP file to your phone. Stay tuned or Subscribe to the Vibe Z2 Pro (kingdom_row) forum For other Android Nougat ROMs, CyanogenMod 14 ROMs, other ROMs and all other device specific topics. The development page for the Lenovo Vibe Z2 PRO CM14/CyanogenMod 14 (Nougat 7.0) ROM is here. Доброй ночи так то вроде прошивка работает, вот когда устанавливаешь гапсы то к гугл сервисам не могу подлючится! Translated by Google: Good night so a bit of firmware running, but when you install the franca to Google services can not is okay! This Lenovo Vibe Z2 Pro is really eye catching and looking perfect. You know I see all this phone specification. I see all side are the best on this phone. But I see this phone front camera is worse. But you know i totally like it. But also some bad sides http://www.china-prices.com/phone-versus/518-2292/lenovo-vibe-z2-pro-vs-huawei-mate-8 but i like this phone so much. But I never use Lenovo phone. This cause have some confusion. Do you have this phone or experience let me know. How is it.